Inspired by „Warped Passages“, Hèctor Parra composed a chamber opera together with Harvard physicist Lisa Randall : the work deals with hidden universes, the existential urge to research as well as our boundaries of understanding and interdependencies in the so-called real world. Now Zafraan Ensemble presents the staged world premiere of HYPERMUSIC PROLOGUE, directed by Benjamin Schad . In addition, this exceptional production shall be documented on film. Nach der Errichtung des Bühnenbildes wird der zweite Probenblock besonders für unsere Sopranistin Johanna Greulich eine sportliche Herausforderung; während sie in Absatzschuhen auf dem Netz herumklettert und dabei gelegentlich auch kopfüber hängt, darf sie das Singen nicht vergessen. Als die Monitore geliefert werden, begrüßt sie Bariton Robert Koller mit Kniefall, denn erst durch sie wird ein freies Darstellen mit steter Sicht auf den Dirigenten ermöglicht, was bei dieser komplexen Musik absolut notwendig ist. Auch außerhalb der Proben tut sich viel: Das Licht- und Videoteam begeht die Sophiensaele, wo die Berliner Aufführungen am 4., 5. und 6. Oktober stattfinden werden, die Umrahmung des Wasserbeckens wird gestrichen, Pressemitteilungen werden auf Englisch und Spanisch übersetzt. Ein szenischer Durchlauf am Samstag beendet den zweiten Probenblock, bevor wenige Tage später die ersten Proben des Zafraan Ensemble beginnen. 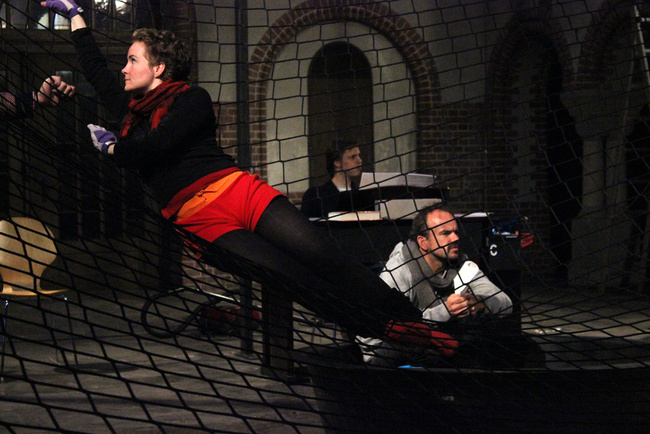 After the stage is set up, the second rehearsal phase poses a sporty challenge especially for our soprano Johanna Greulich: in addition to singing, she now has to climb the net in high heels, sometimes even hanging upside-down. When the monitors arrive, baritone Robert Koller goes down on his knees before them as they make free acting and singing possible in the first place by providing a continuous view of the conductor, which is crucial with this complex kind of music. A lot is happening outside the rehearsals as well. For instance, the light and video crew inspects the Sophiensaele where the performances on 4th, 5th and 6th October will take place, the water basin framing is painted, press releases are translated into English and Spanish. The second rehearsal phase is accomplished by a scenic run-through on Saturday, before Zafraan Ensemble starts rehearsing a few days later.